It’s a public holiday today (thanks Mr President!) so we can go out and cast our vote. 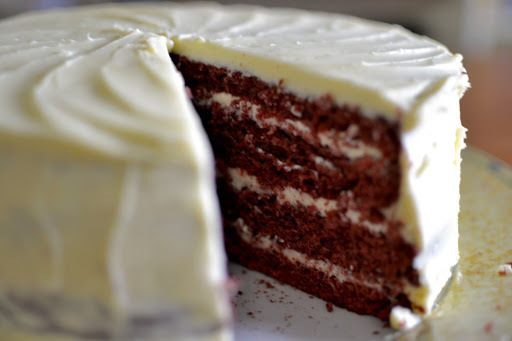 In celebration of the unplanned holiday and because my sister ventured down from the far North for the day, I baked her favourite – Red Velvet Cake. 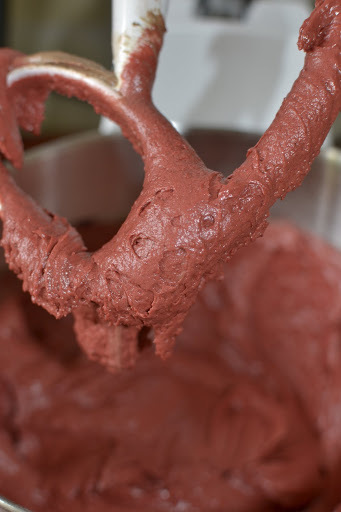 To be honest I don’t really need an excuse to bake Red Velvet. I love everything about this cake. I love its colour, the icing and mostly I love the combination of the not-so-sweet cake with the exceptionally sweet icing. I love this icing so much I could eat it with a spoon for breakfast, lunch and dinner. I iced it when it was still slightly warm (you are not supposed to do this at home folks!) and it was fabulous, for dessert and tea and possibly dinner. 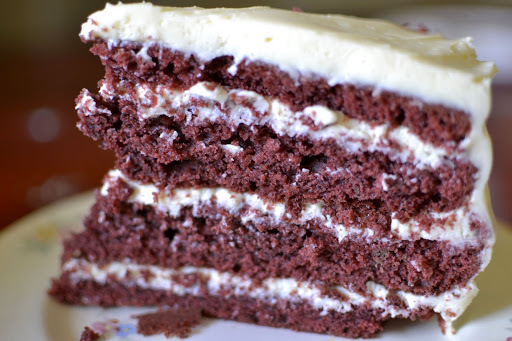 Red Velvet Cake is associated with the American South but was apparently a signature dish at New York’s Waldorf-Astoria in the 1920s. 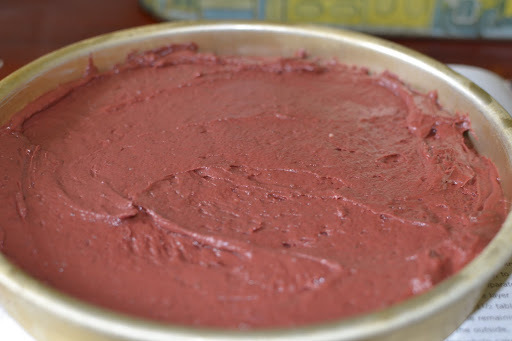 The red colour (that part of it not embellished by food colouring) is said to come from the reaction between buttermilk, cocoa powder and vinegar. Well, my cakes always look like chocolate cakes until I add food colouring into them so I’m skeptical of how true this actually is. 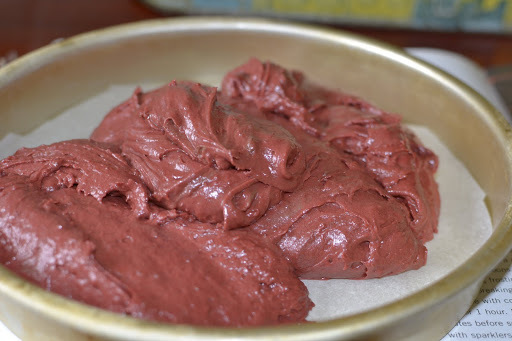 Red Velvet Cakes without cocoa powder are not Red Velvet Cakes. They’re pretending to be but are in actual fact simply ordinary vanilla cakes with red colouring added in. These are pretend cakes people! Cocoa is a key ingredient. 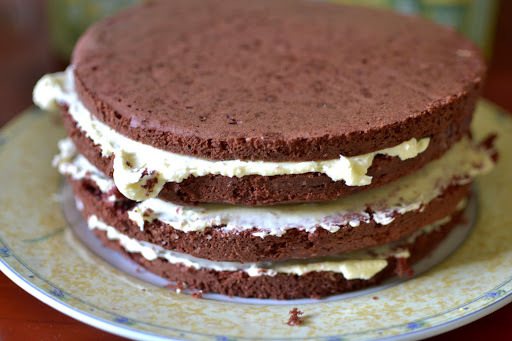 My Red Velvet recipe is adapted from Annie Bell’s book Gorgeous Cakes. It is a much thumbed, very grubby book that I use with fair frequency. Some day I will tell you about the lemon cake she has in there. But not today. I love Annie. Apart from the fact that she has a career I envy (first a chef at Books for Cooks then a cookery writer at Vogue and now a recipe book writer), her recipes always work. There is very little that needs to be done by way of tweaking. 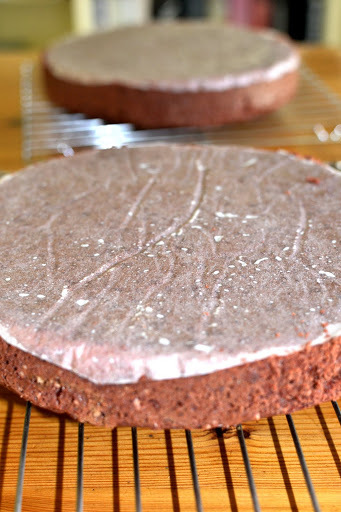 Preheat the oven to 180C and line 2 20cm cake tins. Cream the butter and sugar together until light and fluffy. This will never be entirely pure white because of the brown sugar. Add in the eggs followed by the vanilla. Add in half the flour, then all the buttermilk and then the rest of the flour, beating well inbetween each addition. Mix the vinegar and bicarb in a mug (it will fizz up) and then add this into the mixture. It should be smooth and supple. Lastly add in the food colouring. I haven’t put in a measurement here because I add the colouring in until I reach a colour that appeals to me. Some days its more pink, others its more burgundy. The colour darkens as it cooks too so bear that in mind. Also make sure you beat the colour in well otherwise you’ll end up with streaks. Divide the mixture between the pans and smooth down with a spatula. Bake for approximately 25 minutes until the cakes have pulled away from the sides and are springy to the touch. Allow to cool for 10 minutes before turning out onto wire racks. Cool completely before icing. Cream the butter and icing sugar until bright white and soft. Add in the vanilla followed by the cream cheese. Beat until the icing is smooth, white and soft enough to spread. * I have been using pink food colouring but use red if you so desire. I suspect the overall difference in colour is minimal. ** Use the best cream cheese you can afford because that is all you will taste. I have a love affair going on with Philadelphia so I use that, always.